Hey! My name is Jess and I live and manufacture in Vancouver, BC, Canada. I am originally from Toronto but moved here three years ago. I get a lot of my inspiration for Free Label from the west coast lifestyle. People here are active and want to be comfortable in what they wear, but at the same time they maintain this laidback chic vibe that is exclusive to the PNW. Free Label is comfortable, timeless, movement friendly clothing that is made sustainably and ethically in Canada. Free Label celebrates the human body in its many forms, and I think our easy fits and effortless looks reflect that. I started Free Label in 2015 when I was a manager and buyer for an activewear boutique in Toronto. I was always looking for ethically made not-so-basics that could be worn to workout or to yoga, but also worn throughout the rest of the day. I decided to make my own clothing to fill that gap. We manufacture locally in small runs and with custom fabrics. This means our clothing is often limited in quantities, but it also reduced waste (something the fashion industry as a whole need to improve on!). Free Label fits are also unique in that they cater to the average woman. Unlike most brands, we don’t use size 2 fit models to determine the size and shape of our garments. I fit every piece on my own lumpy and bumpy size 10 body and tweak each style to be flattering on a variety of shapes and sizes. We are also stocked at several boutiques across Canada and the USA. I wear my Reese Pants 2 or 3 times a week and an Andie Bra everyday! I like to be comfortable when I’m running around to our local factories but I don’t’ want to look like I just got off the couch – so this is the perfect outfit for me. 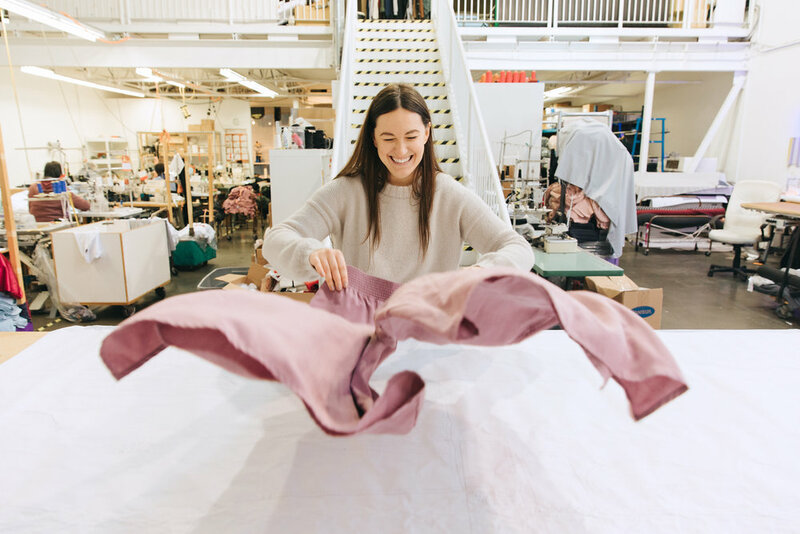 We manufacture most of our fabrics ethically in Canada in compliance with Oeko-Tex 100 standard, which ensures no harmful chemicals. We also choose high quality eco-forward textiles, such as linen, Tencel, Supima cotton and bamboo. These fabrics are biodegradable and long lasting, which helps to keep clothing out the landfill. Even our packaging and marketing materials are made from recycled materials (such as 100% recycled poly mailers and 100% recycled paper hangtags). I’m constantly evolving the brand and our processes toward greener and more ethical practices.